The second of NETGEAR's AC class wireless extenders announced at CES—the EX6100 AC750 WiFi Range Extender—came in recently. It's a less expensive alternative to NETGEAR's top-of-line EX6200 extender reviewed last month, coming in a wall-plugged format. The EX6100 is an AC750 class extender supporting maximum link rates of 300 Mbps in the 2.4 GHz band and 433 Mbps (which NETGEAR rounds up to 450 Mbps in its spec) in 5 GHz. The two radios can extend both bands simultaneously or be configured in what NETGEAR calls "FastLane", which uses one radio as a "backhaul" to the router or AP being extended while the other is used to connect clients. This avoids the 50% retransmission throughput penalty imposed by the basic wireless extension process. The callout diagram below shows the EX6100 can be used as a mini dual-band access point by flipping a switch. There is also a hardware on/off switch, another welcome feature. 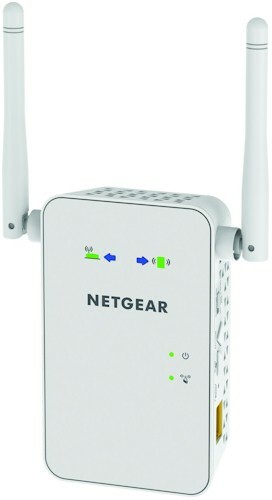 The single Ethernet port is Gigabit and supports LAN connection in AP mode and client connection when used as an extender. Unlike the EX6200, the 6100's antennas aren't upgradeable and there is no USB port to support ReadySHARE USB storage and printer sharing. NETGEAR has been trying to provide onboard visual aids to guide proper extender placement, since this is one of the main causes of wireless extender customer dissatisfaction. The EX6200 had link rate LEDs for each band that turned red / yellow / green to indicate the quality of the connection between the extender and router being extended. However, they weren't very useful to me because I am red / green color blind and because the colors were muted behind smoked dark plastic. The EX6100 takes a novel and potentitally more useful approach by using four LEDs, detailed in the diagram below found in both the installation and user guides shows the LEDs. Color is still used to indicate signal strength, but you get both signal strength from router to extender and from extender to client! Two separate blue arrow indicators direct you to move the extender closer to your router or closer to the location that you are extending signal to. The only catch is that this is a simultaneous dual-band extender with only one set of indicators and no documentation of which band is used to drive the placement indicators. The extender checks TX and RX link rates every second, picks the higher one of them and updates the LED color every 5 seconds based on the highest link rate during these 5 seconds. For example, the extender works in the mode of 11n HT40 (2x2) and detects the following (TX, RX) link rates in 5 seconds: (300, 145), (145, 270), (270, 145), (270, 130), (145, 130). Because the highest one among 300, 270, 270, 270 and 145 is 300, the router link LED lights green. For a dual band extender, the router link LED indicates the link rate of the band which has more (TX+RX) packets in the previous 5 seconds. It follows the same rule to update the LED color every 5 seconds based on the highest link rate during these 5 seconds. A blinking arrow router (or client) LED indicates the extender is placed too far away from the router (or client). If no arrow LED is lit, the location for the extender is good. 2. Router link rate < 0.5 x (average client link rate). 2. Average client link rate < 0.5 x (router link rate). Average client link rate is equal to the average of all clients’ highest link rates. NETGEAR is blocking the internal FCC doc photos until mid-May 2014, so I opened up the EX6100 after testing was completed. The design consists of power and signal boards connected by a four-pin connector, tucked neatly into the case. The two-board assembly is completely removable because the power board connects to the AC plug prongs via spring-loaded contacts. Instead of two dual-band antennas, the left external antenna is 2.4 GHz and the right is 5 GHz. The second 2.4 GHz antenna is a printed circuit board sitting on a bracket that positions it under the top surface of the case. All the key signal components are thermally connected to the RF shield cover via adhesive pads. The RF cover is in turn thermally connected to a metal heat spreader plate. The components summarized in Table 1 show a MediaTek / Realtek design centered around MediaTek's MT7620A wireless SoC that provides the CPU and 2.4 GHz radio. A MediaTek MT7610EN 1x1 11ac radio with Skyworks SE5003L1 power amp handles the 5 GHz side. The MT7620A's five port 10/100 switch goes unused, with the single Gigabit Ethernet port supplied via a Realtek RTL8211E Gigabit Ethernet Transceiver. 64 MB Winbond W9751G6KB DDR2 ? There are more internal photos in the gallery on the next page.